Tue, Jan 29, 2019, 10:45 pm SL Time, ColomboPage News Desk, Sri Lanka. 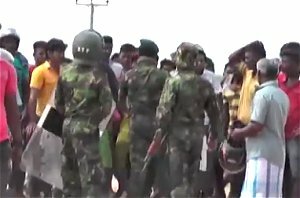 Jan 29, Colombo: Sri Lanka Navy personnel engaged in operations to prevent illegal sand excavation have come under attack by the sand mining racketeers today. A tense situation had arisen between naval officers who were attempting to raid an illegal sand mining operation and villagers in the Kandakadu area in Kinniya today. Going by the directives of the President and Chairman of Geological Survey and Mines Bureau, initiatives have been undertaken to prevent illegal sand excavation and related activities on the banks of Mahaweli River, in close coordination with the Navy. Accordingly, a large number of sand mining racketeers have been taken into custody during joint operations conducted by the Navy and Police Special Task Force (STF) over the past couple of days, the Navy said. The Navy had seized six boats engaged in illegal sand mining in the Mahaweli River in Kandakadu area yesterday (28th January). In addition, the Navy has seized two lorries loaded with illegally mined sand this morning (29th January). Accordingly, the Navy managed to arrest seven persons who engaged in this racket yesterday and today. During another raid conducted this morning in Kandakadu area to arrest another group of people involved in sand mining, the racketeers along with people in the region have behaved aggressively to resist the Navy in an organized manner. On an attempt to apprehend the racketeers, three have jumped into the river and fled the scene. Operations are currently underway in search of the suspects who escaped the arrest. The naval troops had to fire two shots into the air to disperse the rampant crowd as the organized racketeers and residents behaved in an aggressive manner and attempted to attack the naval personnel. The Police and STF personnel subsequently arrived on the scene and they are taking necessary action to get the situation under control, the Navy media Unit said. The racketeers and crowd, who were raving in their conduct, had continued to brutally attack the naval personnel and STF officials who tried to bring the situation to normalcy. However, the Navy said it will continue the operations to fight sand mining rackets.